Of course, you should treat the hair on your head with the same respect that you treat the hair on your face. Washing your hair, after all, is basic hygiene. But whether you wash your hair every day or most days of the week, your hair – like your beard – needs quality products to keep it looking its best. And that brings us to the topic of shampoo, namely, the best shampoos for men. 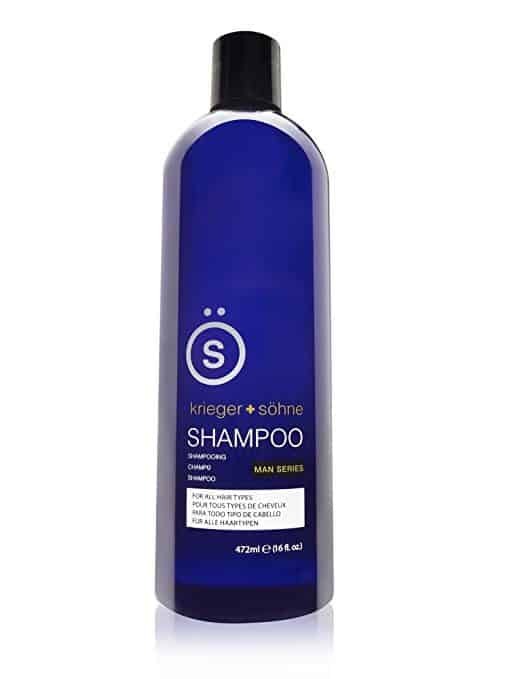 In this post, we’ll look at the best shampoos for men in 2019, starting with Krieger & Sohne Quality Men’s Shampoo as well as take a closer look at exactly at what shampoo is, including its ingredients and how it compares to a conditioner. Our goal is to help you choose a shampoo that works great for you and keeps on working great. Let’s begin by looking at some things to keep in mind when shopping for a men’s shampoo. Shampoo. Conditioner. What’s the difference? So many shampoos, so little time. But the sheer number of shampoos available today is just the tip of the iceberg when it comes to purchasing shampoo. There are many other factors you need to keep in mind before deciding which shampoo is best for you. There’s no mystery here: if your scalp feels oily or greasy, then you have an oily scalp. And if you’re like many men with oily scalps, you’ve tried a wide variety of shampoos to reduce the greasiness – perhaps without a whole lot of luck. It’s not the end of the world – your scalp, after all, is like your face in that it has sebaceous glands that produce sebum and oil – but we understand your frustration. Don’t purchase a shampoo that’s labeled moisturizing, hydrating, soothing, etc. These shampoos have extra moisturizer and exacerbate the problem of an oily scalp. Shampoos with less moisturizing ingredients, such as those called “strengthening,” “balancing,” or “volumizing,” are good for oily scalp so are those called “daily clarifying” or “rebalancing” are good, as well. Make sure you take time to work the shampoo deep into the scalp. It will help the shampoo break up the excess oils. If you fit into this category your scalp often feels dry, itchy, and dandruff is one of your mortal enemies. There are varying levels of dry scalps. If you have minor dryness that doesn’t itch a lot or produce dandruff, then a shampoo that promotes moisture, hydrates, or is specific to curly hair is a good fit on your shopping list. If your scalp is very dry, in which itchiness and dandruff abound, then look for shampoos that include ingredients such as tea tree oil that provide deep moisturizing. Do NOT purchase a shampoo that has strengthening, fortifying, or volumizing on the label. These types of shampoo will eliminate your scalp’s already limited moisture. Count your blessings if you have a normal scalp. Your hair is usually easy to manage and has the ideal amount of oil. Just look for a shampoo that has an even ratio of moisturizing and cleaning. Shampoo’s primary function is to clean dirt and oil from your hair and scalp. Clarifying shampoos usually clean better than other types – although that’s not always the case – they are often harsher and more drying than other types. Some of the best ingredients found in shampoo are jojoba oil, shea butter, palm oil, coconut oil, hydrolyzed keratin, silicones, and olive oil. Coconut oil, for example, is highly nourishing and moisturizing and improves hair strength and flexibility. A shampoo’s scent is a matter of personal choice so you’re on your own here. But read reviews and labels carefully to understand each shampoo’s scent. And some linger and leave your hair feeling fresh all day long. Again, this is a matter of personal choice, but it’s important to know that some companies use animals to test the safety of their products. Look for shampoos labeled “cruelty-free” if animal-testing bothers you. Expensive doesn’t always mean better with most products, and shampoo is no exception. Remember: pricier shampoos you can only buy in a salon often have the same ingredients as those that won’t empty your wallet. 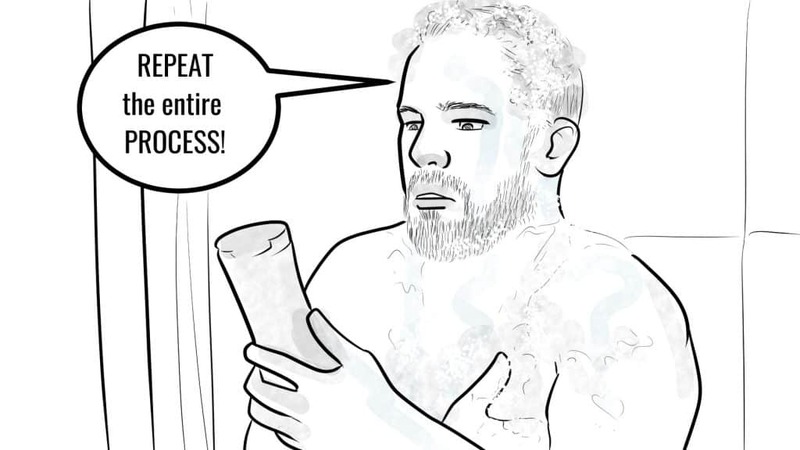 OK, let’s get to the heart (or head) of the matter – the best shampoo for men. Like Redken’s Go Clean shampoo, Krieger & Sohne’s top-selling product isn’t designed for a single hair and scalp type. Instead, it works for men who have thick hair, thinning hair, dry scalp, oily scalp – you get the picture. What helps set K & S Quality Men’s Shampoo apart from many others is its use of tea tree oil. The stuff has healing and therapeutic qualities and is found in a variety of men’s grooming products simply because it works. What’s the big deal about tea tree oil? Well, it has anti-fungal, antiseptic, and anti-inflammatory properties, plus it’s anti-bacterial. That said, the K & S men’s shampoo is your number one ally against dandruff, dry scalp, and psoriasis as it rids your scalp of dead skin cells while fighting bacteria. Indeed, K & S is great for battling the annoying, often embarrassing problem of dandruff. It also gives you another option instead of having to pay for expensive treatments or a medicated shampoo. And it’s great for daily use. Another cool thing about tea tree oil is that it’s also useful for aromatic therapy. It gives the Quality Men’s Shampoo an invigorating kick and aroma that will last throughout the day. The K & S Quality Men’s Shampoo’s list of ingredients also includes peppermint oil, wheat amino acids, citric acid, and glycerin. Note: this is not an all-natural shampoo, but it doesn’t contain harmful additives that are known to strip your hair of its nutrients and natural oils. Finally, it comes with a money-back guarantee. If you don’t like it, just send it back for a full refund. Once you try this shampoo you’ll be hooked. It’s great for all kinds of hair and scalps, but particularly effective in fighting the battle against dandruff. It’s the best dry shampoo for men and you can use it every day. Brickell may not be a household name like some of the other companies included on this list but has steadily made a name for itself since Josh Meyer and Matt Bolduc founded it (in Matt’s garage) just a few years ago. And their Daily Strengthening Shampoo for Men is a steady seller that garners excellent reviews. Like Redken’s Go Clean Daily Shampoo, this is a shampoo for men of any hair type – thick, thin, oily, whatever. But it’s particularly good for men with thinning hair because of its strengthening and thickening qualities. There are plenty of reasons why Brickell is the best shampoo to strengthen hair, not the least of which is its natural list of ingredients. First on the list is hydrolyzed protein, which helps increase the thickness of each hair strand while strengthening the underlying hair structure. But the list goes on and includes: peppermint and tea tree oil, which get rid of scalp flakes while reducing irritation, amino acids, which restore natural shine, and vitamin E, which enhances hair growth by stimulating the scalp and hair follicles. 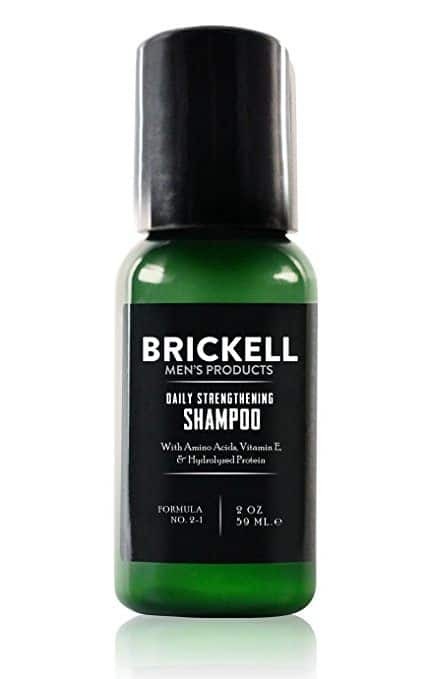 Brickell’s Daily Strengthening Shampoo for Men is not only good for everyday use but also safe for men with color-treated hair. Its gentle natural cleansers provide a deep clean and a scalp that’s free from dandruff flakes. And your hair will look clean when you’ve finished your morning routine. This shampoo’s fragrance is a combination of tea tree mint and a touch of citrus lime. Meyer and Bolduc are adamant about creating men’s skincare and grooming products by using only natural ingredients while catering to the needs of every man. Their products are now sold in over 20 countries and featured in notable publications such as GQ, Men’s Journal, and more. That said, their Men’s Daily Strengthening Shampoo is worthy of all the attention it gets. You’ll pay a bit more for this product than you would for some other shampoos, but it’s worth the investment. While it won’t help stimulate new hair growth like shampoos specifically designed to fight hair loss, it thickens the hair you already have and you’ll notice quick results. 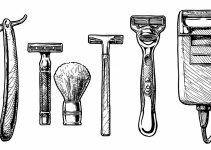 Our advice about using your wife or girlfriend’s grooming products is almost always, “Don’t do it.” Don’t use her razor. Don’t use her shaving cream. Don’t use her shampoo. There are just too many products designed and formulated specifically for men for you to have to reach for her stuff on the sink or shower stall ledge. When it comes to Art Naturals’ Organic Moroccan Argan-Oil Shampoo, however, it’s perfectly fine if you share. It’s a shampoo that’s perfect for you and her, ideal for daily use, and ranks right up there regarding the best shampoo for thick hair. The Organic Moroccan Argan-Oil Shampoo earns high marks for its list of all-natural ingredients. Argan oil is its key ingredient – as the shampoo’s name suggests – and it hydrates and soothes hair while counteracting the harmful effects of sun damage and blow drying. So, make sure to use a good hair dryer. Another important ingredient is jojoba oil, which replenishes your hair’s natural moisture while promoting natural hair growth. Jojoba oil is packed with Vitamin E and B-complex vitamins to act as a natural emollient. It soothes your scalp, unclogs hair follicles, and promotes hair growth. Peach, avocado, and almond oils also aid with hydration and taming split and frizzed hair endings. Its fragrance is subtle – as would make sense for a shampoo that’s good for men and women – and has subtle hints of vanilla and honey. As mentioned, all of the Organic Moroccan Argan-Oil Shampoo’s ingredients are natural, and paraben- and cruelty-free. We think it’s the best natural shampoo for men. The Organic Moroccan Argan-Oil Shampoo is an all-natural solution to a myriad of hair issues, not the least of which is restoring your hair from sun damage and other effects. Moreover, you’ll like how your hair looks after you’ve used this shampoo. If it’s a Head and Shoulders product, then you know it’s all about fighting dandruff. 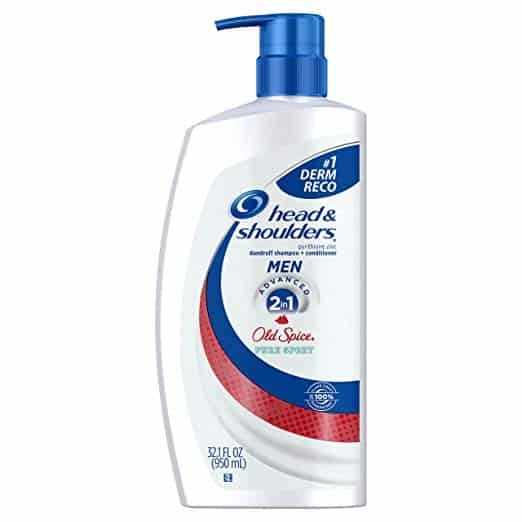 The H&S Old Spice 2-in-1 Shampoo is great for dealing with dandruff and a flaky scalp, as you’d expect. But it has other benefits, as well, including its Old Spice scent. If you’re an Old Spice kind of guy, you’ll love this shampoo. But even if the fragrance isn’t that important to you, there’s still plenty to like about this shampoo. For one, it’s pH balanced (and dermatologist approved) for everyday use on all hair types, even if your hair is color or chemically-treated. For another, it also serves as a conditioner and helps lock in moisture while providing a deep cleansing. The key dandruff-fighting ingredient in this shampoo is Pyrithione Zinc, which breaks up and destroys the fungus that causes dandruff. Meanwhile, the 2-in-1 Shampoo calms itchiness and relieves irritation. And who wouldn’t want to be spared the aggravation of scratching their hair numerous times a day (causing even more dandruff flakes to fall out)? But again, this is shampoo that does more than what it’s best known for, i.e., clearing up dandruff. As mentioned, it includes a conditioner, while its Old Spice scent is as manly as it gets. Head & Shoulders knows what it’s doing when it comes to fighting dandruff. Their 2-in-1 Shampoo + Conditioner is no exception, but it also moisturizes and conditions hair, while delivering a scent that will last throughout the day. American Crew was formed in 1994 and has since become of one of the leading men’s grooming brands in the world. 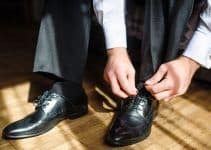 There’s nothing trendy about Crew – although some might consider it that way – and their products get a boatload of positive reviews. Their Daily Moisturizing Shampoo is one of their top products and, while it’s suitable for men of all hair types, it works particularly well for men with dry hair and scalps. That’s not surprising given the shampoo’s well-balanced dose of moisturizer that doesn’t weigh your hair down like shampoos that overdo it with moisturizer. A key ingredient in American Crew’s Daily Moisturizing Shampoo is Panama bark extract, a natural ingredient that provides a thorough cleaning without stripping your hair and scalp of natural oils. It’s good for daily use although some users report excellent results using it just three to four times a week. Wheat protein is added to provide shine and strength, while rosemary and thyme extracts help tone and moisturize the scalp. Rice bran oil, another natural ingredient, adds sheen and elasticity. The Daily Moisturizing Shampoo is excellent for clarifying your hair, as well. Clarifying means providing a deep cleansing that removes the stubborn build-up of mineral deposits and chemicals that become part of your hair and scalp over time. While some clarifying shampoos can damage your hair if used too often, but American Crew’s moisturizing shampoo is strong enough to provide a deep cleaning but mild enough to be used every day. You’ll rid your hair of unnatural build-up while sealing in moisture. Strong but not too strong to be used every day. American Crew’s Daily Moisturizing Shampoo does a lot, not the least of which is providing you with a deep cleaning. If you have dry hair, you’ll want to check this shampoo out. We’ve already talked about the different scalp types and how certain shampoos are better for different scalps. Redken, however, isn’t interested in catering to just one hair or scalp type with its Go Clean Daily Care Moisturizing Shampoo. Its advanced formula addresses many issues – dry or greasy scalps, thick or thinning hair, even dandruff. Redken’s winning formula includes protein, which strengthens hair and helps prevent hair loss, and glycerin, a great moisturizer found in many men’s products – one that tackles the problem of dry or frizzy hair. And this shampoo smells awesome – awesome enough that some men use it as a body wash. But Redken isn’t one to brag about its scent, at least not with the Go Clean Daily Care Moisturizing Shampoo. Instead, their mission is to produce a shampoo that leaves your hair stronger, more manageable, and your scalp hydrated. You’ll avoid dandruff – never a hit with the ladies – while your smells great (which they’ll love). Meanwhile, it doesn’t contain extra conditioner, which means it rinses off easily in the shower. Another thing to be said for Redken: they’re always stepping up their game by pushing technology that improves their products. 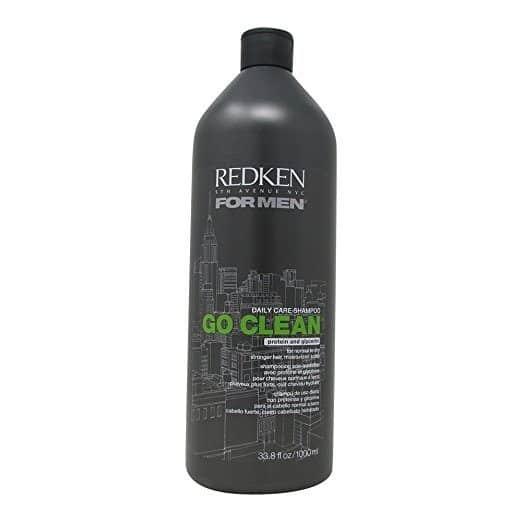 Redken’s Go Clean Daily Care shampoo is an excellent all-around product that also happens to be the best smelling shampoo for men. It strengthens and moisturizes while providing daily cleansing. Every Man Jack’s Thickening 2-in-1 Shampoo & Conditioner provides the convenience of a product that allows you to handle two jobs at once – shampooing and conditioning – and also comes at the right price. 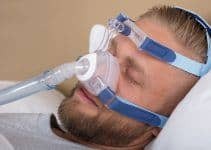 You’ll even find it on most drugstore shelves, which provides a bit of shopping convenience, as well. Then again, convenience only truly counts if the product performs that way it’s supposed to do. Every Man Jack’s Shampoo and Conditioner does just that as it deeply cleans the hair and scalp while removing excess oil and other build-ups. Unlike a lot of drugstore shampoos, however, the Every Man Jack Thickening 2-in-1 Shampoo & Conditioner ingredient list isn’t loaded with synthetic crap that can damage your hair (and isn’t necessarily all that great for your overall health, either). It doesn’t include parabens, dyes, sulfates, or phthalates. The shampoo portion of Every Man Jack’s shampoo and conditioner is coconut-based, and coconut oil is one of those “superfoods” that’s risen in popularity in the past several years because of its many health benefits, including those for the hair and skin. It also contains shea butter that helps condition and soften the hair, as well as soy proteins that strengthen hair follicles. In short, you’ll get a gentle cleansing that also moisturizes and strengthens your hair and scalp. It’s gentle enough for daily use. 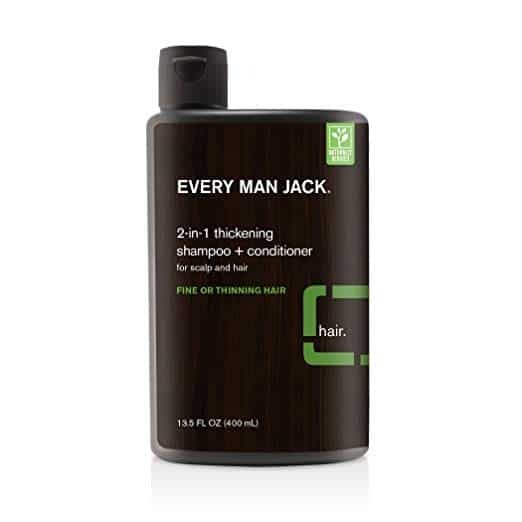 We also like the Every Man Jack Thickening 2-in-1 Shampoo & Conditioner scent, which is slightly minty with hints of tea tree. Every Man Jack’s Thickening 2-in-1 Shampoo & Conditioner delivers superior results with natural ingredients that help keep your hair healthy instead of damaging it. It’s nicely-priced and readily-available. Now that you’ve picked out your new favorite shampoo it’s time to take it for a spin – around your head and scalp that is. And what’s so hard about shampooing, right? You just lather, rinse, and if you so choose, repeat. Start by thoroughly rinsing your head and scalp. You don’t have to stand under the nozzle forever, mind you, but let a gentle stream thoroughly saturate your hair. Also, make sure the water is warm but not too hot. Water that’s too hot can strip your hair and scalp of essential oils. Next, apply a bit of shampoo into the palm of your hand. A spoonful or so should suffice; the key is to work up enough lather that covers your hair from root to tip. Work the shampoo into your hair and scalp by using a circular motion with your tips and fingers. Start from the front of your scalp and work your way down to the back, then back up again towards the temples. Continue this motion for a few minutes so that you’re properly stimulating and exfoliating the scalp. Don’t be in a rush to rinse the shampoo off of your head and scalp. Let it sit there, up to a minute if you wish, to further let the shampoo work itself into your hair. Now rinse off the shampoo completely. 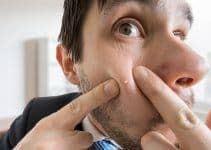 Don’t be lackadaisical about this step because you truly want to get all of it off or your scalp (and hard to notice places like on your neck or behind your ears). Again, use warm – not hot – water. Rinse and repeat? OK, there’s some controversy around this step because shampoo manufacturers typically encourage you to rinse your hair clean and then repeat the entire process. However, most people only need one application of shampoo, and too much shampooing can dry out your hair and scalp. The fact is, most shampoo manufacturers want you to “rinse, lather, repeat” because it means you’ll use up your bottle of shampoo more quickly – and need to buy more shampoo. Apply conditioner. It’s up to you to decide if you want to include this step in your regimen. Conditioner can provide many benefits, including extra hydration, and many men are using conditioners these days. If you decide to join the club, simply apply your conditioner in the same way that you applied shampoo. But you should always leave it in your hair for a few minutes before rinsing it off. Dry your hair with a soft towel by using a patting or stroking motion. Tugging or pulling at the hair can cause damage and breaking. For better comfort, make sure you use a good robe too. Question: Should I wash my hair every day? Answer: Most men do, but it comes down to how dirty and greasy your hair feels on any given day. There’s certainly no harm in washing it every day. There are two bottles on your shelf that look very much alike but do completely different things. You got it, they’re your containers of shampoo and conditioner and while both are hair care products, the similarities often end there. When used together, however, they may help you get the kind of healthy hair you’ve always wanted – a nice one-two punch, if you will. Let’s take a look at shampoo and conditioner, their differences, their uses, even the chemicals unique to each. Let’s start with the oldest of the two. Shampoo has been around for, well, not quite forever, but long enough. It comes from the Hindi word “champo,” which means to massage the head with some kind of hair oil. Indeed, before the advent of commercial shampoo at the turn of the 20th century, most people cleaned their hair with regular soaps and oils. Perhaps some men still use bar soap as their shampoo of choice today, but we can’t imagine that the percentage is high. So, what is shampoo, exactly? Perhaps the best way to describe shampoo would be to say “it’s like a detergent for your hair and scalp.” It’s made up of detergents and surfactants, a chemical that creates suds and cleanses the dirt and oil in your hair. Shampoo’s primary purpose is to remove the particles that build up in the hair, including dandruff and environmental pollutants. They’ll also help remove dead skin cells that build up on your scalp and attach themselves to hair follicles. Here’s another thing about shampoo: water makes up almost 70 to 80 percent of the entire formula. The rest consists of cleaning agents, oils, anti-dandruff agents, etc. These cleansing agents are typically mild and primarily used for removing dust and excess oil from the hair. Hair conditioner is a hair product that is used to improve the condition of the hair. Simple enough. Because shampoos may strip your hair of natural oils – although many include moisturizers which seek to alleviate that issue – conditioners may be applied after shampooing to make up for the loss. And this of conditioner types is long: from moisturizing and deep conditioners to acidifying conditioners and color protection conditioners. Conditioner ingredients include moisturizers, lubricants, anti-static agents, surfactants, and more. Cetearyl alcohol, an agent designed to reduce evaporation on the skin, is a key ingredient in most moisturizers. Meanwhile, emollients help keep the skin moist and reduce evaporation on the skin and hair while producing a protective film on the skin. They can also restore vitamins and minerals that were lost through shampooing. The pH level is higher in conditioner because it provides a balance that promotes the development of amino acids – which make your hair shinier and full of body. Shampoos have a lower pH balance. Unlike shampoo, conditioner can either be washed out or left in the hair depending on the product (and your preference). And, unlike shampoo, it doesn’t produce lather. There were plenty of contenders when it came to choosing the best of the best of men’s shampoo. But we wanted to keep the list somewhat compact to help you narrow your buying options. We also wanted to provide a range of shampoos that were good for a variety of hair types, including for men who are experiencing hair loss. And we also strive to choose products from a variety of price ranges to compile a list that works for any man’s budget. A product’s list of ingredients is another thing we consider. We’re generally partial to those that have natural ingredients, but we’re also open-minded. A shampoo’s scent and anti-dandruff properties are also things we consider. OK, that’s all for now. As always, we welcome your comments and general feedback. If you have a favorite shampoo that you think belongs on this list, let us know. Or, if you have questions about the products listed here, don’t hesitate to ask. We’d love to hear from you. There’s literally never a scientific reason to not use your “wife/girlfriend’s” shampoo/products. The article states that they advise against you using them because there is stuff that is formulated for men, I implore you to explore that statement instead of being mislead the same way you always have. Women products may actually be better for you. Why avoid them if you like the scent? They won’t dry your scalp or make you oily (unless intended to…same as men’s products), they don’t burn your testosterone off, there’s no such thing as anything being formulated specifically for men unless it’s some kind of medicine. Not even our PH balances differ. But god forbid you emasculate yourself by smelling like flowers under your ballsweat smelling cologne. Don’t listen to this crap, buy what you like. So I am going to give Krieger & Sohne’s shampoo a try and see if it improves my dry scalp. I think one thing you need to kinda touch on is longevity with some of these companies. I am not sure about other guys, but I do not constantly try new products. I stick to something and kinda of just deal with it because its what I know. I am willing to jump ship if I know something will be there next year, next 5 years, and so forth. So here’s hoping. Really informative list, I would personally add Maple Holistics to the list.